Video shows a car speeding down a residential street then slamming into a parked vehicle. The force was so great, it moved the vehicle about two feet and pushed the parked car's front end onto the curb. DENVER — Video shows a car speeding down a residential street then slamming into a parked vehicle. The force was so great, it moved the vehicle about two feet and pushed the parked car's front end onto the curb. 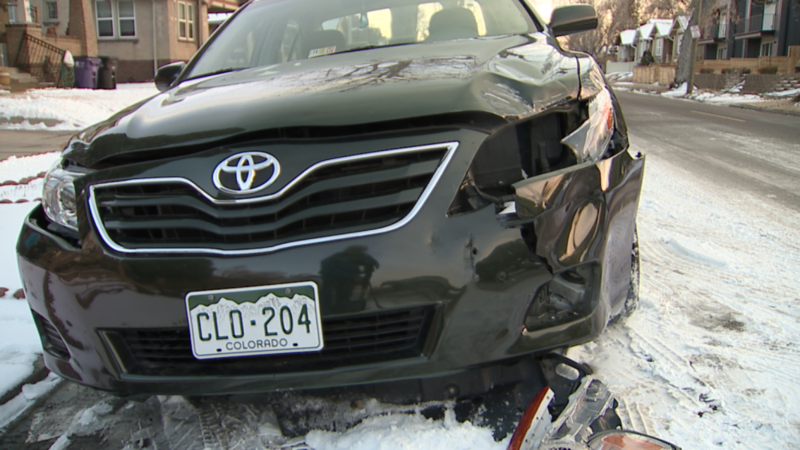 Carol Vokoun reached out to Contact7 because she wants to call attention to hit-and-run crashes in Denver, including the one in front of her house near Sloan's Lake off West Colfax Avenue. "You know accidents happen, they could’ve just left a note or come up to our door," said Vokoun. Vokoun and her wife didn't hear the crash but they saw the aftermath when they left their house to run errands the next morning. At first, they weren't sure what happened to the car, but their neighbor's surveillance camera caught the crash. "They had the presence of mind to do like a three-point turnaround and then take back off going toward Colfax," said Vokoun. The car belonged to her brother-in-law who had been on hospice at their home. He lost his battle with cancer about a week before the crash. "A lot going on, definitely a lot going on, we weren’t thinking about where his car was parked. We had it parked in what we thought was a reasonably safe place," he said. Several local businesses have also provided surveillance images, but it's hard to make out the license plate or tell what kind of car it is. “My neighbor across the street had an instance of a hit-and-run. It’s like anyone you talk to has experienced something like this," said Vokoun.